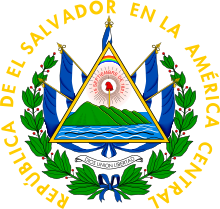 El Salvador (/ɛl ˈsælvədɔːr/ ( listen); Spanish: [el salβaˈðoɾ]), officially the Republic of El Salvador (Spanish: República de El Salvador, literally "Republic of The Savior"), is the smallest and the most densely populated country in Central America. It is bordered on the northeast by Honduras, on the northwest by Guatemala, and on the south by the Pacific Ocean. El Salvador's capital and largest city is San Salvador. , the country had a population of approximately 6.34 million. Tourism accounts for a large part of El Salvador's economy. It offers many natural attractions including, beaches, a mild tropical climate and lush landscapes. It also offers an important archaeological and ecological heritage, with colonial and pre-Columbian vestiges, and national reserves. Organized crime in El Salvador is a serious problem. Efforts to understand or deal with this phenomenon in the small Central American country have been insufficient. The main sport played by Salvadorans is association football. The Estadio Cuscatlán in the capital San Salvador is the largest stadium in Central America, with a capacity of just over 45,000. The stadium is the home ground of the El Salvador national football team, as well as club teams Alianza FC and San Salvador F.C. Water resources management in El Salvador is characterized by difficulties in addressing severe water pollution throughout much of the country's surface waters due to untreated discharges of agricultural, domestic and industrial run off. The river that drains the capital city of San Salvador is considered to be polluted beyond the capability of most treatment procedures. This page is about the cultural area. For the economic region, see Mesoamerican region. For the geographic area, see Central America. For other uses, see Mesoamerica (disambiguation). Gender inequality can be found in various areas of Salvadoran life such as employment, health, education, political participation, and family life. Although women in El Salvador enjoy equal protection under the law, they are often at a disadvantage relative to their male counterparts. The Spanish conquest of El Salvador was the campaign undertaken by the Spanish conquistadores against the Late Postclassic Mesoamerican politics in the territory that is now incorporated into the modern Central American nation of El Salvador. El Salvador is the smallest country in Central America, and is dominated by two mountain ranges running east-west. Its climate is tropical, and the year is divided into wet and dry seasons. Before the conquest the country formed a part of the Mesoamerican cultural region, and was inhabited by a number of indigenous peoples, including the Pipil, the Lenca, the Xinca, and Maya. Native weaponry consisted of spears, bows and arrows, and wooden swords with inset stone blades; they wore padded cotton armour. ... that during the Spanish conquest of El Salvador, the Spanish town of San Salvador was destroyed by natives within a year of being founded by Gonzalo de Alvarado? Do you have a question about El Salvador that you can't find the answer to? For editor resources and to collaborate with other editors on improving Wikipedia's El Salvador-related articles, see WikiProject El Salvador.